A look into ‘Project Nyonyi’ the PwC Forensic Review of the Crane Bank! This are just one of them days, when the glaciers really get to much heat and becomes water. Than underneath all those years of ice and snow, you will find some relics of the past, which was hidden by the massive amounts of snow. That nothing these things hidden inside the glacier, that had the need to resurface, because no one would have the capacity to dig that deep. In the same sense, the PriceWaterhouseCoopers report of the Crane Bank reveal damaging reports on the state of the Bank. 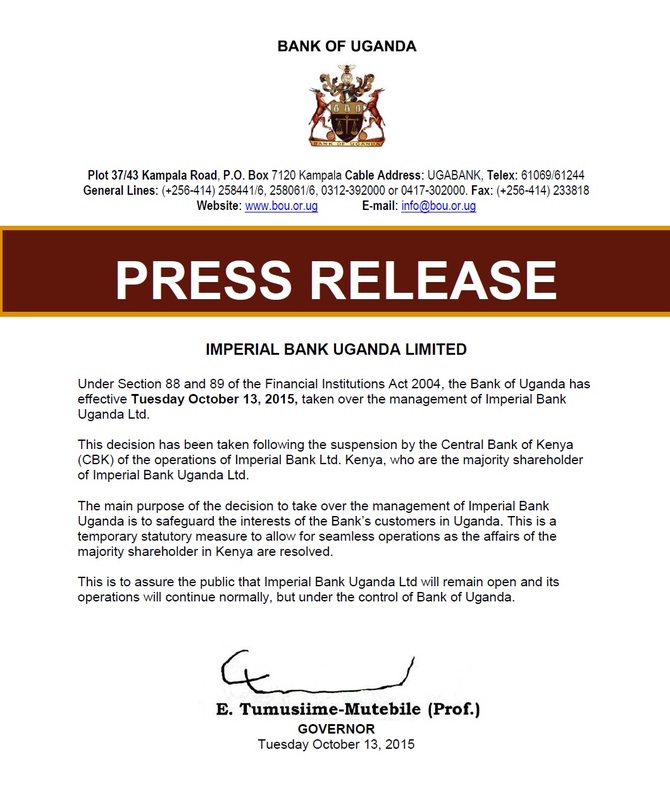 The Bank that Bank of Uganda took into receivership before trading to another third party. The bank that were praised and suddenly disgraced itself. Therefore, lets look at the important quotes from the report! “This report has been prepared solely for BoU for use in considering immediate steps to safeguard Crane Bank’s interests and the additional investigative and evidence collation work that is required on key areas of concern to enable the preparation of a report that can be adduced as evidence in a court of law” (PwC, P:3, 2016). “The above direct and circumstantial evidence suggests that Dr Ruparelia and persons associated with him, effectively owned and controlled 96% of CBL (With control of White Sapphire, the only shareholding not held by Dr Ruparelia and his immediate family, is the 4% shareholding held by Mr Jitendra Sanghani, (“Mr Sanghani”)). This contravenes the prohibition on an individual or body corporate controlled by one individual owning more than forty nine per cent of the Bank’s shares, and the restriction on the right to control financial institutions by those who are not reputable financial institutions or public companies as set out in S.18, and 24 of the Financial Institutions Act 2004 as amended (“FIA”)” (PwC, P: 14, 2016). “The false accounting was partly achieved by crediting income with entries from off-book accrued interest receivables accounts and by keeping some liabilities (fixed deposits and borrowings from other financial institutions) off the books” (PwC, P: 15, 2016). “The off book liabilities were brought back into the books in 2013 and a fictitious asset recognised by overstating the balances in the Nostro Account. It is not clear why CBL brought back this liability at this point. Due to this entry in the Nostro Account, as at 31 December 2013, there was a difference of USD 80m or UGX 200B between the system and actual balance in one of the Nostro Accounts; the Deutsche Bank USD account” (PwC, P: 15, 2016). “As at 20 October 2016, loans amounting to UGX 63.6B had been advanced to related companies out of which lending totalling to UGX 63.1B (99%) had not been disclosed as insider lending. In addition to the companies considered as insiders in deriving the amount above, there are allegations that Logic Real Estates and Developers Limited (“Logic”) which had an outstanding balance of UGX 26.9 B as at 20 October 2016, is also related to Dr Ruparelia. Logic obtained this loan on 23 December 2014 and the amount appears to have been deposited back into a CBL “interest receivable” account labelled “Personal FD”” (PwC, P: 18, 2016). It is not strange that a Crane Bank fell, when all the irregularities and mismanagement in their practices comes to the forefront. The Bank of Uganda could have seen this, but did not act upon it. They just let it be and let it go. That must have been because of the ties between Dr. Ruparelia and President Museveni. Certainly, the political affiliation has helped the financer and foreign investor in his prospects in Uganda. Since the off-books practices plus over-extended ownership did not apply to current legislation concerning healthy bank practices. Still, they let it all happen. This secret PwC report even entails provisions and statutes the owner of the bank has breached in his practices. “Dr Sudhir Ruparelia: As a Director, major shareholder, vice chairman and generally as a person that exerted the greatest control over the Bank, Dr Ruparelia, concealed his true shareholding in the Bank; he oversaw the irregular transfer of the Bank’s branches to MIL, he benefitted from irregularly declared dividends, ‘due’ to White Sapphire; he conspired with others to embezzle/cause financial loss to CBL by use of cash extractions from Interdico, AI and TA; he was instrumental in the approval of credit facilities for related companies and associates, when there was no intention the loans would be repaid; and he failed to disclose his interests.  Receiving stolen property in respect of bank branch transfers, and White Sapphire dividends.  Receiving and possessing property for himself or related parties, otherwise than in payment for the full value, in respect of the branch transfers, (FIA S126 (6).  Breach of the Prohibition on insider transactions” (PwC, P: 23, 2016). When you read that a review and outsider opinion sees this and that the Bank of Uganda are just taken the bank into custody before trading it off to DFCU. Proves that they knew of the liabilities and the off-books practices, but put a blind an eye to the matter. Don’t see and don’t tell policy are clearly the BoU acts of the day, no matter what principle or legislation that has been breached by the former foreign investor in the good graces of the President. Certainly, this is again, with all the other reports of the sudden fall of grace for the ones astonishing bank, the Crane Bank are now history and eaten by DFCU. While the subjects running this one to the ground are walking around like free men. The ownership and board are left off the hook, even as this secret report entail embezzlement and fraud of the bank. This is accepted and repeated without any consideration of all the clients and customers who at one point trusted the Crane Bank. They we’re used as pawns, to secure wealth for Dr. Ruparelia and his comrades. Peace. WASHINGTON D.C., United States of America, April 6, 2016 – A team from the International Monetary Fund (IMF) led by Roger Nord, IMF Mission Chief and Deputy Director of the African Department, visited Kampala from March 21 to April 6, to conduct the sixth review of Uganda’s economic program supported by the Policy Support Instrument (PSI). “In a complex global, regional, and domestic environment, affected by election-related uncertainties, Uganda’s economy continued to perform well. Economic growth is expected to reach 5 percent in the current fiscal year and accelerate to 5.5 percent in FY2016/17, supported by the scaling up of infrastructure investment. Following a sharp depreciation of the shilling, inflation increased, with core inflation reaching 7.6 percent in December 2015, though it has since then decelerated to 6.9 percent. “Performance under the PSI has been mixed. There has been progress on increasing tax revenue, strengthening international reserves, extending the Treasury Single Account to local governments, and establishing public investment management guidelines. The decisive monetary policy response, in the context of appropriate exchange rate flexibility, contributed to the stabilization of the shilling and successfully curbed inflation expectations. However, the end-December 2015 overall deficit target was not met, poverty reducing expenditures were below target, and some structural reforms suffered delays. “The mission commends the authorities for the steadfast implementation of fiscal policy in a complex electoral environment. Revenue over-performed through end-December 2015 and expenditure pressures were reasonably well controlled. While some fiscal tightening had been envisaged in late 2015 in the face of significant exchange rate pressures, the economy subsequently stabilized more rapidly than expected, leading the authorities to revert to the original budget targets. However, there were some renewed fiscal pressures in early 2016, including a slowdown in revenue and some additional spending. The mission welcomes that the supplementary budget currently before parliament aims at minimizing year-end slippages. The mission encourages the authorities to strengthen efforts to boost taxpayer compliance to compensate for the revenue shortfall. “The mission welcomes the 2016/17 budget currently before parliament, which envisages a continued scaling-up of infrastructure investment while boosting domestic revenue by 0.5 percent of GDP, in line with the objective to raise Uganda’s revenue performance to levels observed in regional and other peers. The mission encourages the authorities to continue building capacity and controls to manage large public investment projects. It will also be important to avoid within-year reallocations from public investment to less productive government spending. “The mission welcomes the decision by the Bank of Uganda (BOU) to lower the central bank rate, consistent with the forecast of core inflation returning to its medium-term target. The mission commends the BOU for its effective communication strategy, which contributed to well-anchored inflation expectations, reflected in sharply falling yields in recent weeks. The appropriate easing of monetary policy should provide a welcome boost to private sector credit growth and support economic activity. “The mission welcomes the approval of the amendments to the Financial Institutions Act, expected to foster credit expansion and deepen the financial sector. The mission encourages the authorities to expedite the adoption of appropriate regulations to implement the new Public Finance Management Act in line with international best practice. The mission also urges the authorities to complete the reconciliation and validation of the stock of domestic payment arrears and take all necessary measures to avoid their recurrence. “The mission is reassured by ongoing efforts to ensure Uganda’s prompt exit from the Financial Action Task-Force’s list of jurisdictions with strategic deficiencies in the legal framework for combating money laundering and the financing of terrorism (AML/CFT). The mission urges the authorities to take the necessary steps to facilitate the prompt exit, including by passing the amendments to the Anti-Money Laundering Act and the Insurance Act before May 2016. “The mission met with Hon. Mr. Matia Kasaija, Minister of Finance, Planning and Economic Development; Professor Emmanuel Tumusiime-Mutebile, Governor of the Bank of Uganda; Mr. Keith Muhakanizi, Permanent Secretary/Secretary of Treasury; and other senior government officials, and representatives from the business, and international communities. The mission thanks all counterparts for their collaboration. The PSI is an instrument of the IMF designed for countries that do not need balance of payments financial support. The PSI helps countries design effective economic programs that, once approved by the IMF’s Executive Board, signal to donors, multilateral development banks, and markets the Fund’s endorsement of a member’s policies (seehttp://www.imf.org/external/np/exr/facts/psi.htm). Details on Uganda’s current PSI are available at imf.org/uganda. There have been some local, regional, and international media reports regarding a decision by Barclays Bank Plc to reduce its shareholding in Barclays Africa Group Ltd which involves twelve (12) African countries including Uganda. Barclays Bank Uganda Ltd. has since held two press conferences to clarify the details of these new developments. Further to the clarifications offered by Barclays Bank, I wish to reassure the Ugandan public that the Barclays Bank Plc announcement does not affect the operations of Barclays Bank Uganda in any way and there will be no interruption to the services Barclays Bank Uganda Ltd extends to its customers. The regulatory framework in Uganda ensures that any transitions of this nature are orderly and do not affect the soundness and stability of the financial sector as well as provision of financial services to customers. 1. Commercial Banks in Uganda are incorporated locally and function as independent subsidiaries and not as branches. As such, Barclays Bank Uganda Limited is an independent subsidiary of the Barclays Bank Africa Group (in which Barclays Bank Plc owns 62.3% ) and is fully incorporated and registered in Uganda. Being a subsidiary, Barclays Bank Uganda has its own capital base, Management and an autonomous Board of Directors. This insulates the subsidiary from issues affecting the parent entity. 2. The Financial Institutions Act 2004 as amended by the Financial Institutions Amendment Act 2015 and associated regulations provides for a clear procedure for the disposal of Bank of Uganda supervised financial institutions’ shares. If the shareholders of any bank choose to dispose off their shares, the Bank of Uganda will undertake the necessary process of vetting new shareholders to ensure they are fit and proper to run a financial institution in Uganda. 3. Barclays Bank Uganda Limited remains solvent and liquid. It is well capitalised with a capital adequacy ratio well above the statutory minimum of 8.0 percent. The banking sector in Uganda as a whole has a strong asset and capital base with a capital adequacy ratio of 18.8 percent, as well as a relatively low level of nonperforming loans of about 5.3 percent as at December 2015. I therefore wish to assure the Ugandan public and customers of Barclays Bank Uganda Ltd. in particular that there is no cause for concern arising from the media announcements by Barclays Bank Plc. Customers should therefore continue with their normal banking transactions without any anxiety. The Bank of Uganda is committed to prudent supervision and regulation of financial institutions in order to ensure the stability and soundness of the financial sector, as well as the safety of customers’ deposits.